The Secretary-General of the United Nations, Antonio Guterres, addressed the Community on the Exercise of the Inalienable Rights of the Palestinian People, Friday, to discuss the humanitarian emergency in Palestine. Guterres emphasized the effect the crisis has had on the youth of Gaza, stressing that they are left with “little prospect of a better future”, stating this issue must be “immediately addressed”, reported WAFA. The Secretary-General insisted that the nearly two million Palestinians living in Gaza, are “increasingly mired in poverty and unemployment, with no access to health, education, water, and electricity”. He reaffirmed the UN’s support for “the return of the legitimate government to Gaza”, what he called an “integral part of a future Palestinian State”. 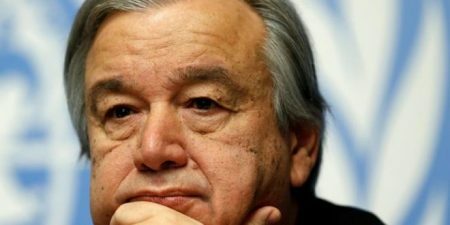 Guterres appealed to Israel to “lift the restrictions on the movement of people and goods”, and he praised the “critical work” of the UN Relief and Works Agency for Palestine Refugees in the Near East (UNRWA). He called on the international collective to strengthen its monetary support to help revive Gaza’s economy. He stated that the expansion of illegal settlements in the occupied West Bank and East Jerusalem, “risk further unrest in the West Bank”, and “deepen the sense of mistrust and undermine the two-state solution”. The Secretary-General added that Jerusalem should be a shared capital of the two states, Israel and Palestine. Finally, the Secretary-General mentioned the 70 years of occupation that the Palestinians have suffered under, and “the denial of their legitimate right to self-determination”. He expressed his regret that Israel failed to renew the mandate of the Temporary International Presence in Hebron, stating he hopes an agreement can be made to preserve the crucial service.